Now, those cookies may not look like much from the outside. But on the inside (where it really matters, amirite?) there is a delicious, melt-y, chocolate-y NUTELLA center. And no one can resist nutella. Keep that in mind the next time someone approaches you at a bar. Get to know them. They may be filled with nutella too! 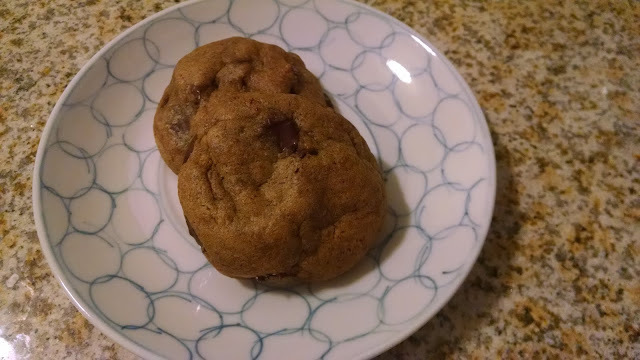 As part of the 2015 Great Food Blogger Cookie Swap, I baked the above cookie and sent them out to my three match-ups ... Lynsey Lou's, The Kitchen Adventurer and Recipe Runner. Hopefully the ladies enjoyed their cookies - and from the Instagram posts I got, I think they did! My coworkers also enjoyed the sample that I gave them so I'll need to bake more soon. 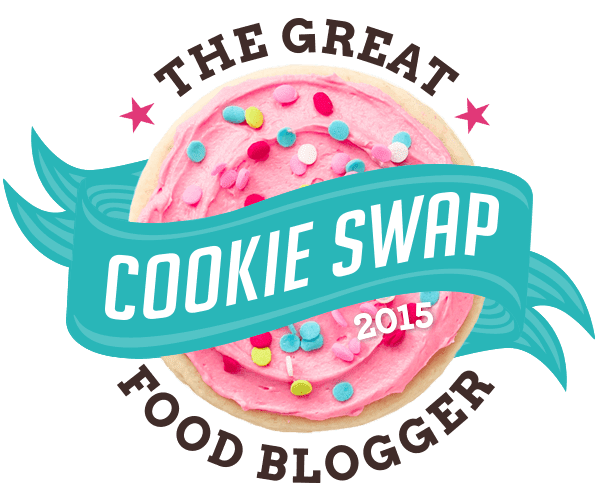 Every year, I participate in this cookie exchange as part of the holidays, but the great thing about it is that to participate, the swappers are asked to donate $4 and the proceeds to go Cookies for Kids' Cancer. In the last few years, we've raised over $7,000 with just this exchange during the holidays, in tandem with the brand partners (Dixie Crystals, Land O Lakes and OXO), who match all contributions 1:1. Not only that but they send us nifty little gifts for participating! This year I got a set of measuring beakers and a silicon baking mat - both super cool! Definitely think of joining next year if you're also a blogger - it's fun and everything goes to a great cause! First of all, refrigerate your nutella. I can't stress this enough. If I have an enemy, I'm just going to cover them in nutella and they'll go insane trying to get it off. IT GETS EVERYWHERE when it's at room temperature. In a skillet (preferably not coated), melt butter over medium heat - stirring constantly. 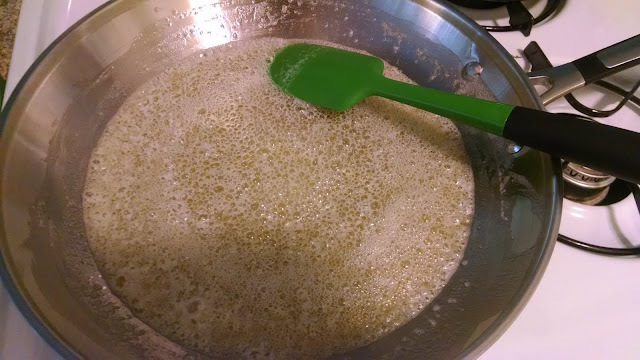 Once the butter begins to foam and has the aroma of a nutty flavor, remove it from the heat immediately or the butter will burn and that's no good for everyone. 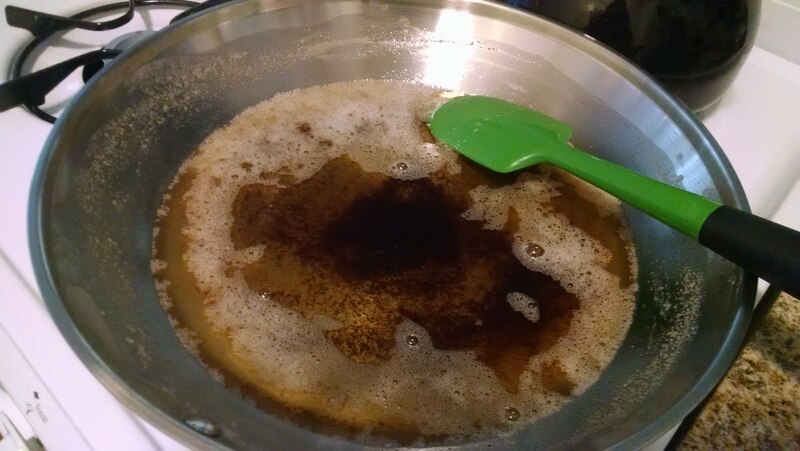 It will be slightly brown at the bottom of the pan. Set it aside and let it cool down. In a medium bowl, combine the flour and baking soda, incorporating well. In the bowl of an electric mixer, combine the cooled brown butter, salt and sugars, blending thoroughly. Add in the egg and egg yolk, pumpkin, spices and vanilla - mix well again. Turn down the mixer to the lowest speed and add the flour mixture slowly. 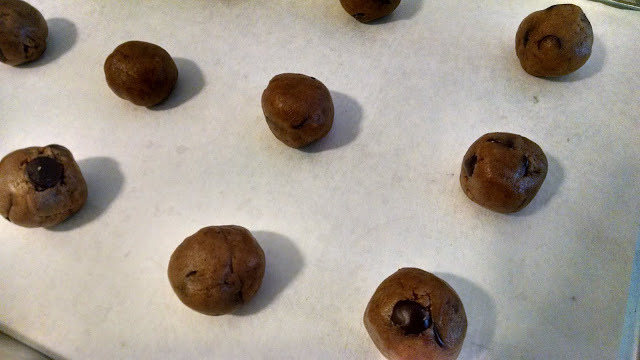 Remove from the blender and fold in all the chocolate chips. Chill dough for 2-3 hours to make it easier to work with. Preheat oven to 350degrees. Measure out 1.5 tablespoons of dough out and smash it flat between your palms. Put a chunk of refrigerated nutella in the middle, then roll the rough around it and form a ball, sealing the nutella completely. 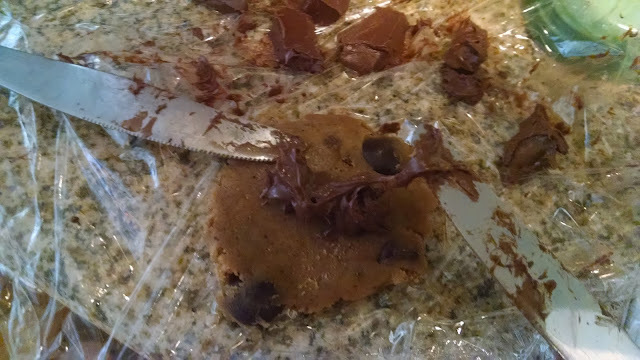 The best way to do this is to use two knives so your hands never touch the nutella. It helps if you have a sheet of Saran Wrap laid out and you can take out a few chunks at a time, and keep refrigerating the rest. Don't ever touch the nutella!! Bake the cookies for 10 minutes or until they begin to turn brown. Don't worry if they look underdone in the middle - you don't want fully cooked nutella! Thanks to the ladies of Ambrosia Baking for your chewy ginger molasses chews, The P.K.P. Way for your holidays spice coookies and a mystery sender that sent chocolate peppermint crunch cookies for my sweets - my coworkers and I enjoyed them immensely!! Looking forward to the 2016 cookie swap! !